Jesus uses parables—“an earthly story with a heavenly meaning,” as I learned in Sunday school—to teach us about the kingdom of God. We are part of the kingdom of God, and we need to do a better job of acting like it. Since Jesus talks much about the kingdom of God and next to nothing about church, perhaps we need to more seriously consider the kingdom of God as the basis for our behaviors, attitudes, and priorities. The Sower: The farmer plants seeds. Some grow and produce a yield, but some don’t (Luke 8:5–8, Matthew 13:3–9, Mark 4:3–9). The Lamp under a Bushel: People don’t turn on a light only to cover it (Luke 8:16–18, Matthew 5:14–15, Mark 4:21–25). New Wine and Old Wineskins: Putting fresh wine in old wineskins will break the skins and spill the wine (Luke 5:37–39, Matthew 9:17, Mark 2:21–22). The Fig Tree: A budding fig tree signals the approach of spring (Luke 21:29–33, Matthew 24:32–35, Mark 13:28–31). The Wicked Tenants: Farmers rent a vineyard but refuse to pay their landlord and are punished in the end (Luke 20:9–16, Matthew 21:33–41, Mark 12:1–9). The Mustard Seed: A mustard seed is small but produces a large tree (Luke 13:18–19, Matthew 13:31–32, Mark 4:30–32). The Faithful Servant: A good servant is always ready and will be rewarded (Luke 12:35–48, Matthew 24:42–51, Mark 13:34–37). The Strong Man: A strong man can protect his house, but a stronger man can overpower him (Matthew 12:29-32, Mark 3:27-29, Luke 11:21–23). The Wise and Foolish Builders: Wise people build their house on a stable foundation (Luke 6:46–49, Matthew 7:24–27). The Minas: Some servants invest their master’s money and earn a profit for him, but not all of them do (Luke 19:12–27, Matthew 25:14–30). The Lost Sheep / the Good Shepherd: A shepherd leaves his flock to search for one sheep that wanders off (Luke 15:4–6, Matthew 18:10–14). The Great Banquet: Some people miss a great feast because they’re too busy, and others take their place (Luke 14:15–24, Matthew 22:1–14). The Leaven: A little bit of yeast makes dough rise (Luke 13:20–21, Matthew 13:33). The Two Debtors: The person forgiven of the greater debt is more appreciative (Luke 7:41–43). The Pharisee and the Publican: One man exalts himself before others, while another humbles himself before God (Luke 18:9–14). The Evil Judge: A judge eventually gives a poor woman justice to stop her from bugging him (Luke 18:1–8). The Master and Servant: Servants work and do their jobs without receiving thanks or honor (Luke 17:7–10). The Unjust Steward: A man about to lose his job abuses his authority to gain favor from others (Luke 16:1–13). The Rich Man and Lazarus: The poor Lazarus dies and goes to heaven; a rich man dies and goes to hell (Luke 16:19–31). The Lost Coin: A woman loses one coin and diligently searches until she finds it (Luke 15:8–9). The Wedding Feast: People assume a place of honor at a party and are embarrassed; others don’t and are elevated (Luke 14:7–14). Counting the Cost: Don’t build a building if you’re not sure you can pay for it; don’t go to war unless you think you can win (Luke 14:28–33). The Barren Fig Tree: A fig tree that produces no fruit receives a second chance, but not endless chances (Luke 13:6–9). The Rich Fool: A rich man built bigger barns to store his wealth so he could take it easy, but he died the next day (Luke 12:16–21). The Friend at Night: A man pounds on his neighbor’s door for help in the middle of the night (Luke 11:5–8). The Good Samaritan: A man goes to great risk to help another in need (Luke 10:25–37). The Tares: Weeds grow in the field and will be separated from the grain and then burned after the harvest (Matthew 13:24–30). The Pearl: A man sells everything to buy a pearl of great value (Matthew 13:45–46). Drawing in the Net: All fish are caught in a fishnet. The good ones are kept and the bad ones discarded (Matthew 13:47–50). The Hidden Treasure: A man discovers buried treasure and then buys the property so he can have it (Matthew 13:44). The Unforgiving Servant: A man is punished after he is forgiven of a large debt but then refuses to forgive a small debt owed to him (Matthew 18:23–35). The Workers in the Vineyard: All men receive a full day’s wage regardless of how many hours they work (Matthew 20:1–16). The Two Sons: One son tells his father he won’t work and then does; the other son promises to work and then doesn’t (Matthew 21:28–32). The Ten Virgins: Ten girls anticipate a party. Some are prepared to wait and they get in; the ones who aren’t prepared miss out. (Matthew 25:1–13). The Sheep and the Goats: A shepherd separates his sheep from his goats (Matthew 25:31–46). The Growing Seed: A man plants seeds, but he can’t control what happens to them (Mark 4:26–29). 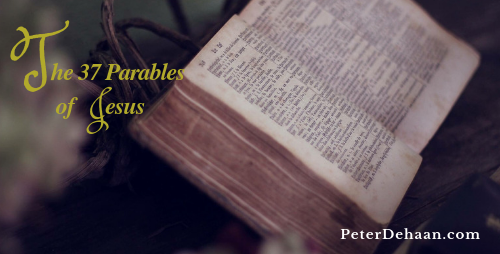 A synopsis of each parable is given, but their meanings are for you to consider. May each one guide us into living the life Jesus wishes us to live.